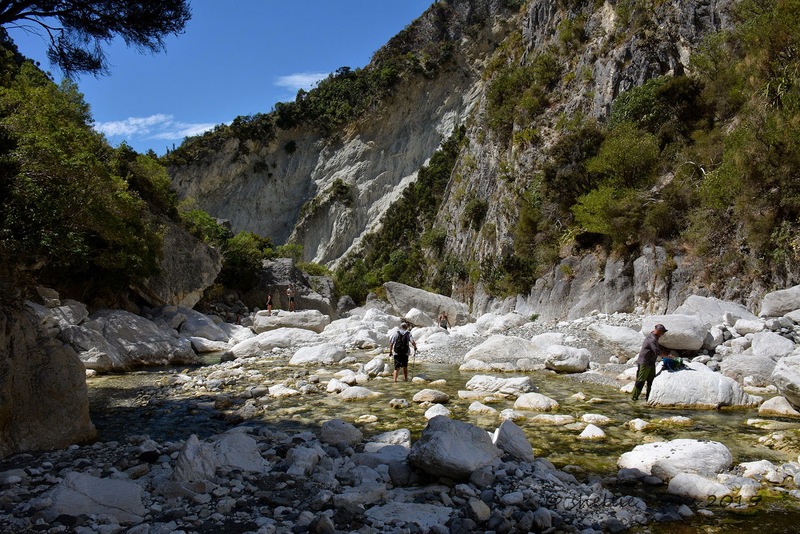 After wading through water, crossing the Waima River at least 30 times, clambering over rocks and boulders in the river bed for the last hour and a three quarters, we took a short steep bush track up and over and into Isolation Creek where the Sawcut Gorge is located. For another 5 minutes or so we scrambled over more boulders before finally turning a corner to find the Sawcut Gorge right in front of us looking very narrow and like a deep cut in the rock wall. Duh- hence the name Sawcut. 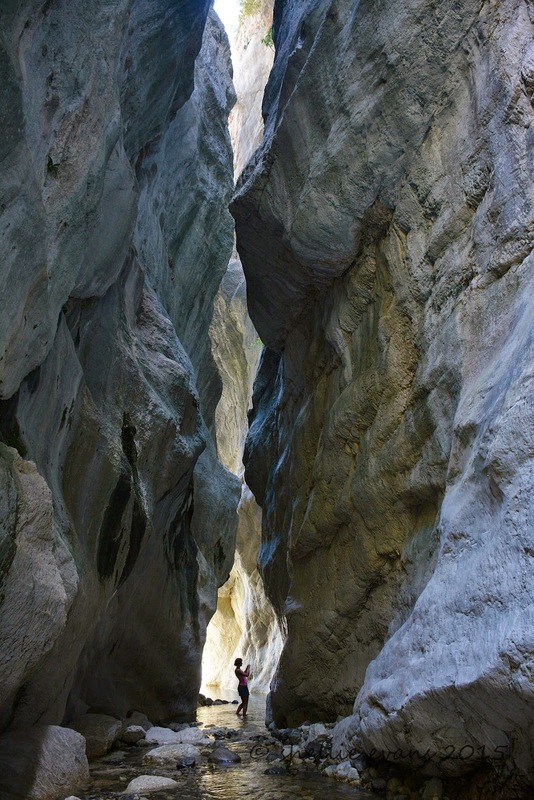 Sawcut Gorge is New Zealand’s finest slot canyon and comparable to the slot canyons of Utah in States. The chasm is 50m deep, 50m high and in places only 2m wide. It’s not until you see a person near the entrance that you get an idea of how impressive the canyon is. 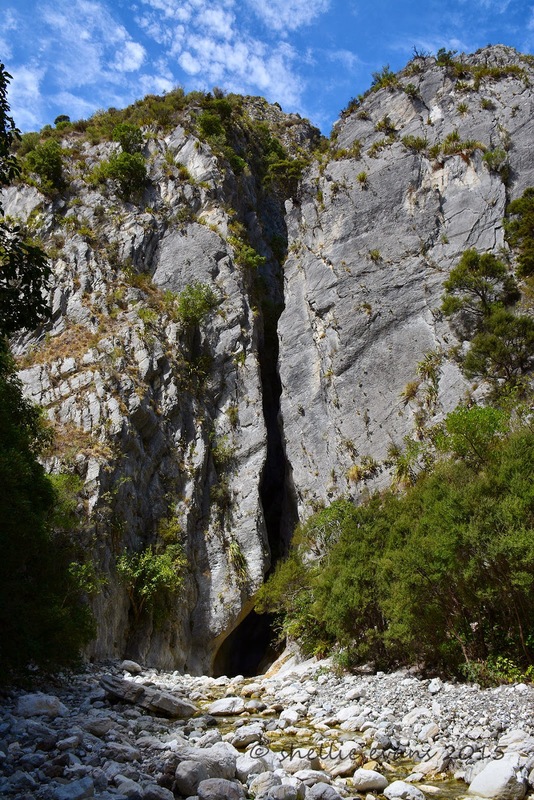 The “Sawcut” itself is a short and narrow passage where Isolation Creek has eroded through a 50m high wall of limestone, leaving a unique slot that’s higher than it is long. 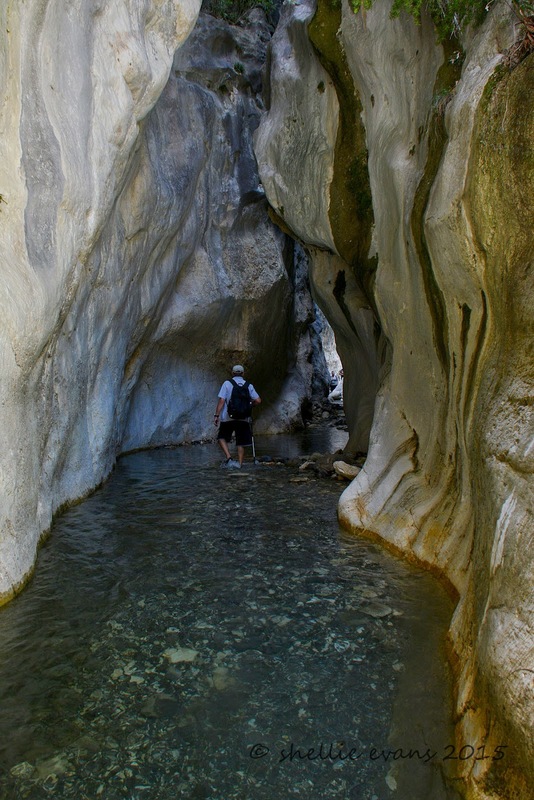 Inside the canyon the water is cool and clear and free of algae (it needs sun to grow), we wade through marveling at the smooth, curved and colourful walls…. .....and the plants that are hanging off the sides in places. 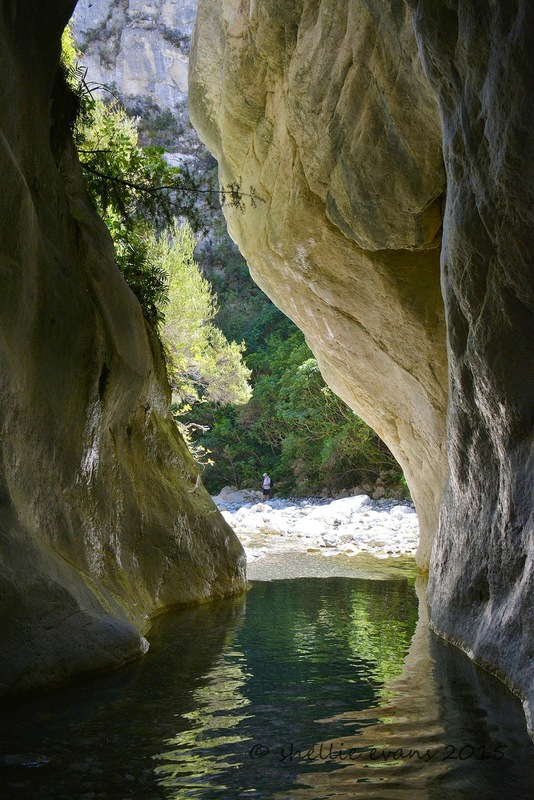 David stops to talk to three women coming back through the canyon…..
And I wait until they pass so I can catch their silhouette against the opening & before they exit …. David carries on and by the time I catch him up he has settled on a rock waiting to have lunch. The ‘party’ we had been told about were also having their lunch on the rocks just outside the canyon. With little space, we had to walk right through the middle of them to get past…. As did these girls that came through while we were resting. I’m sure they were on a ‘hen party’ weekend, they were carrying water pistols & bow & arrows, some had cowboy hats on and others Indian feathers in their hair bands. They were headed for Isolation Hut, a 6 bunk DOC hut an hour further on up Isolation Creek, I hope there are none others up there otherwise they’re going to be sharing a bunk or two. 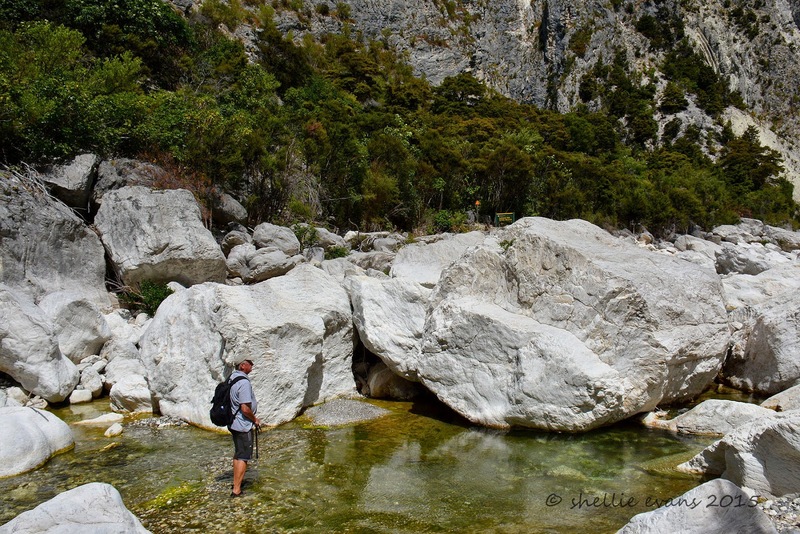 I walked up the creek after them for another couple hundred metres or so to see if the boulders got any smaller. They didn’t. After a short rest and a bite to eat, David went ahead of me back through the slot so I could get a silhouette shot of him as we passed through. Two guys were approaching from the other end, both wearing gumboots (wellington boots). Well they had been wearing gumboots, they were holding them and wading through the water, fancy coming all this way wearing gumboots! No grip whatsoever, they must have struggled walking over all those rocks in the riverbed and have sore feet when they did have to remove the boots. One of the guys had a gun slung over his shoulder, they told David they were heading for the hut where they were going to go hunting for deer. Ah-oh, 2 + 5 + any others = too many people, not enough bunks. I waited for the guys to pass me before heading out, David was patiently waiting for me. Well actually he was waiting and checking, yet again, his tracking app on his phone- David will never be lost in the bush! 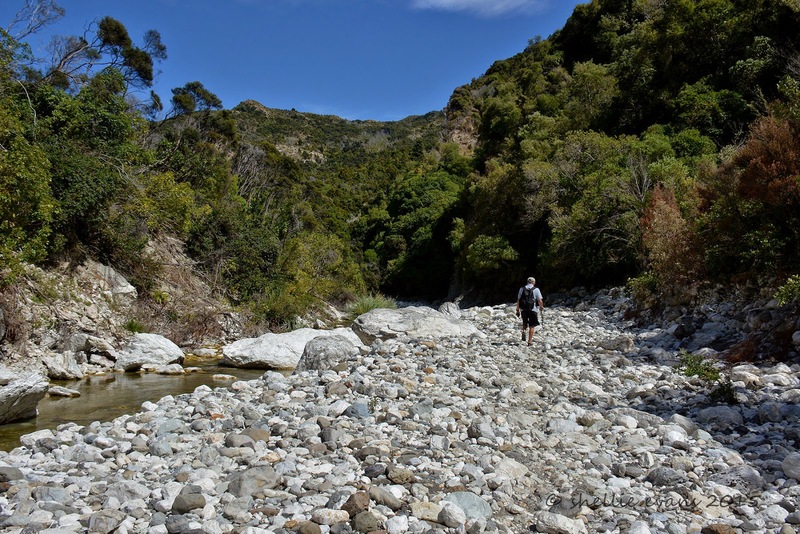 We headed off down the creek, back over the bush track, around the corner and back into the Waima River bed. The return trip is just as confusing and just as demanding. Nothing looks familiar. Except DOC’s orange triangles pointing the likely way to go. 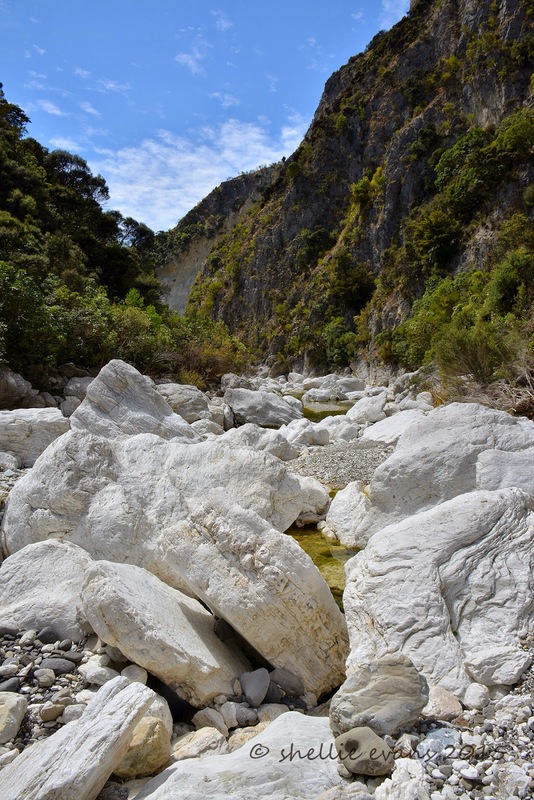 The stark white limestone boulders are very impressive, they look like blocks of ice at the end of a glacier. 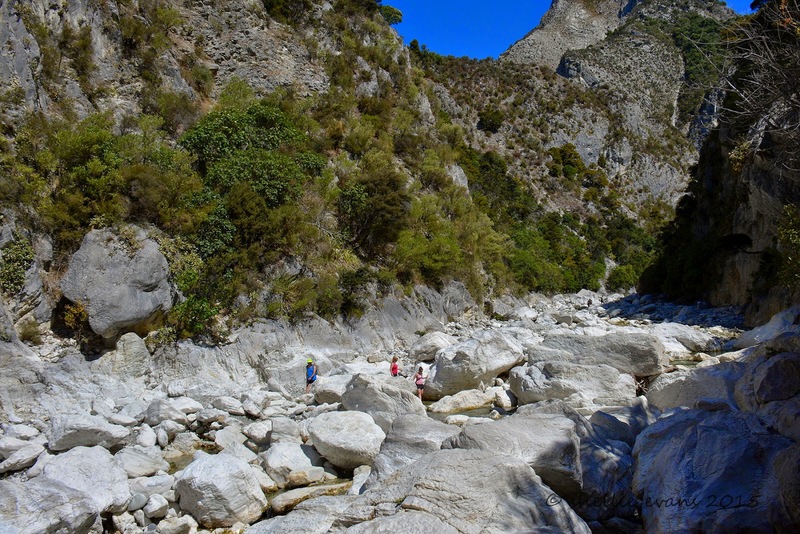 We come across two groups of people making their way to the gorge, the guy on the right is filling his water bottle, the group at the back are having a water fight, cooling down on a hot afternoon. They still have around a 40 minute walk to get to the gorge and it about 3pm. Unless they hurry up they’re going to be walking back down a cold riverbed. The sun is due to disappear behind the bluffs above us. Back behind us another two groups are making their way back to the carpark. The front group told us, when we saw them later at the cars, that they stopped to have a swim in a large pool- the one we had waded through on the way up. The one with the ‘pet’ eel. They didn’t mention an eel encounter so perhaps he has hibernated through the hot summer. Part of the track passes through the bush on the side of the river, it’s narrow and steep and requires a bit of maneuvering around and holding onto tree trunks. 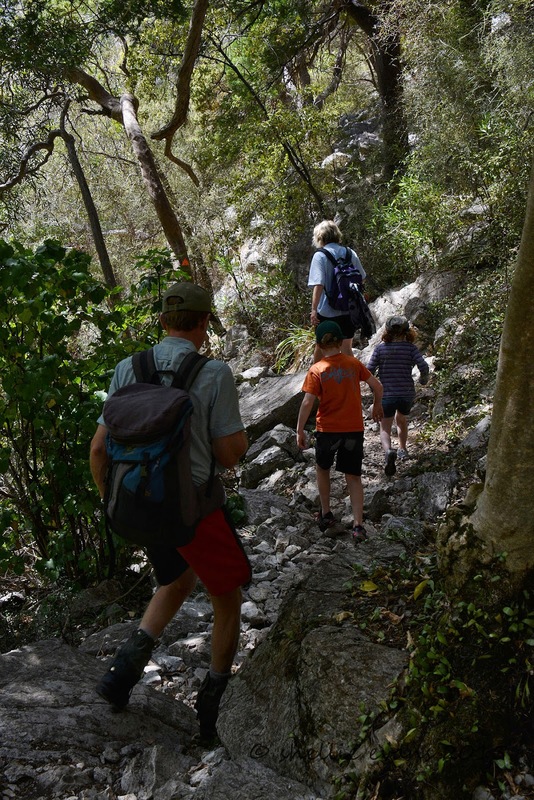 It is with some surprise we come up behind a family group gingerly picking their way over the rocks. A couple with older parents, a toddler in the backpack and a 3 year old, holding his own over the rocks. They proudly tell us they’ve been to the Gorge and their son has walked the whole way. We haven’t the heart to tell them that they would have only made it to the reserve where the boulders are big and the bluffs are vertical above the river. 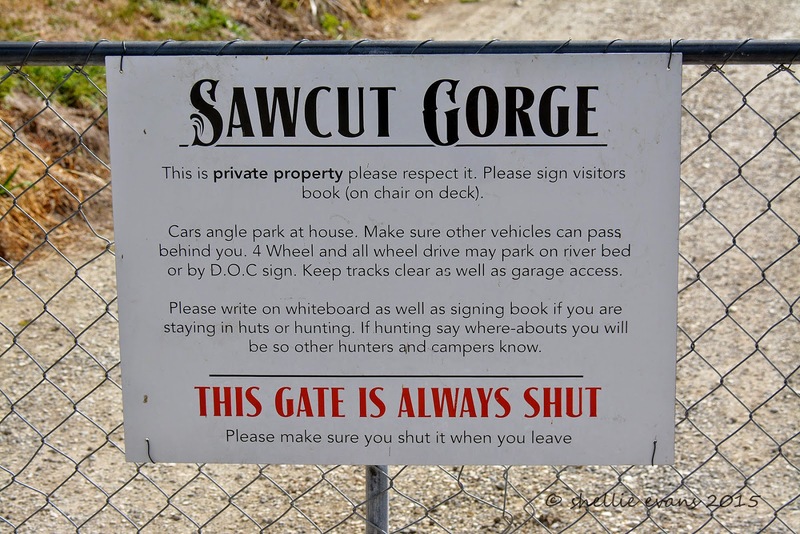 It probably looked like a ‘Sawcut’ gorge. 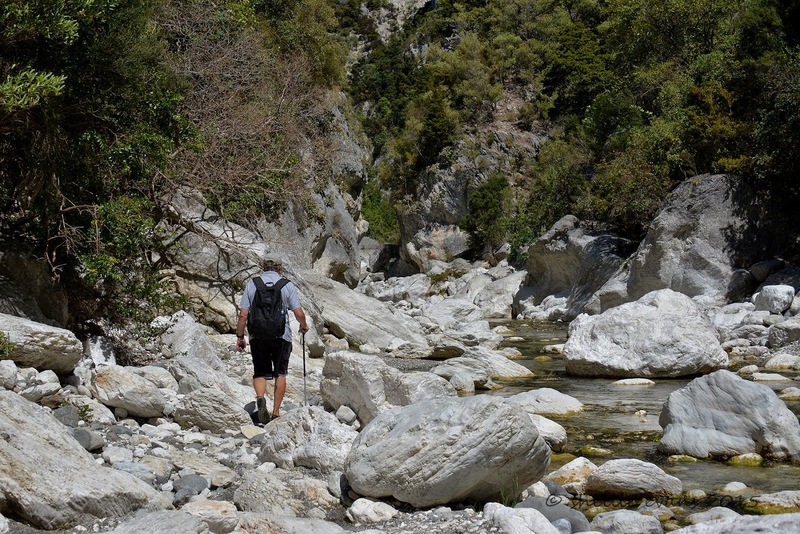 The boulders make way for rocks and the walking becomes easier. 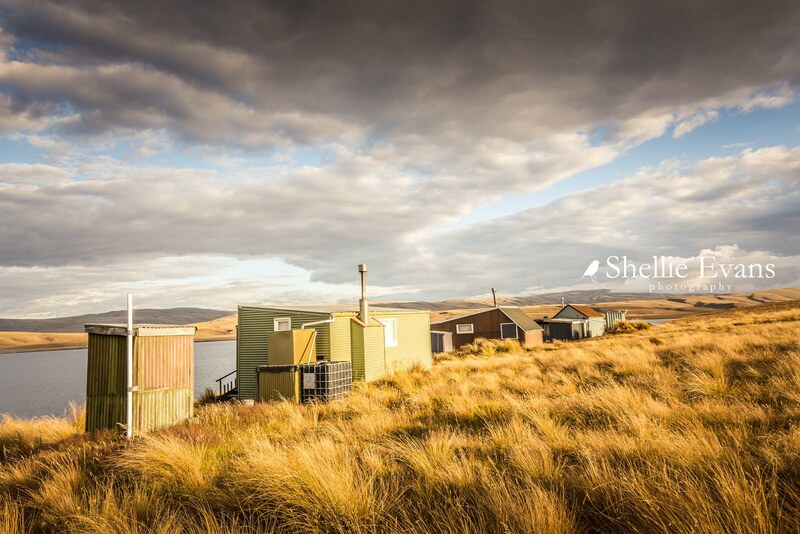 We look back up the river and say a farewell to Isolation Hill. Just a handful of crossings and near level ground ahead of us and we’re back at the car. I wonder if the slips that we see happened in the ‘quakes. And I wonder how long it took for them to be cleared. Finally four and a half hours after setting off we were back at the ute. We sat on the tailgate in the hot afternoon sun with a welcome cup of tea in hand, reflecting on the walk. 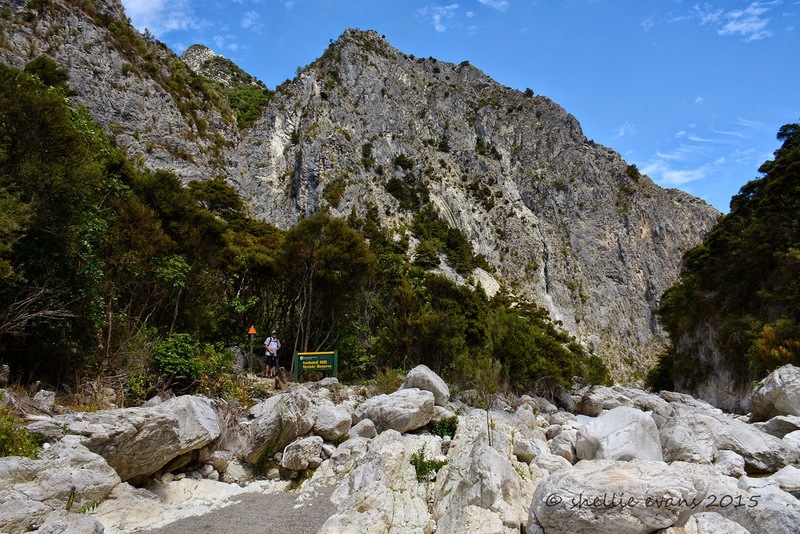 With sore feet and stiff legs from all the rock hopping (and for me, a sore arm from carrying my camera the whole way) we decided that while it wasn’t exactly a gut-busting walk, it was very challenging. 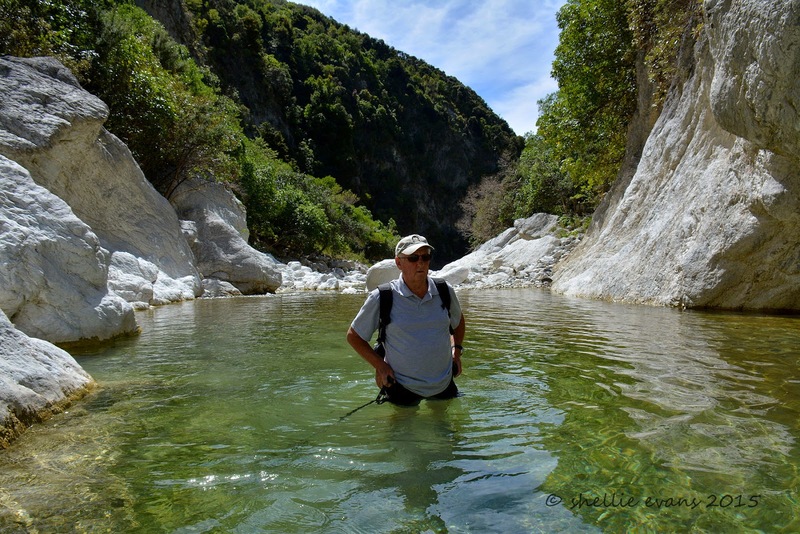 You definitely need a walking pole to steady yourself climbing up and down the rocks and to check position & stability of them in the water, and the water depth in some of the deeper pools. A sign at the homestead, by the visitors book, made me smile- ‘Please leave your walking sticks in the river bed where they belong’. It was just as well I didn't get a bunch of flowers for our anniversary the other week, I got a lovely new walking pole from David! I had my hands full; pole in one hand, camera in the other plus sunglasses on my head and pack on my back, it was all a bit of a juggling act! 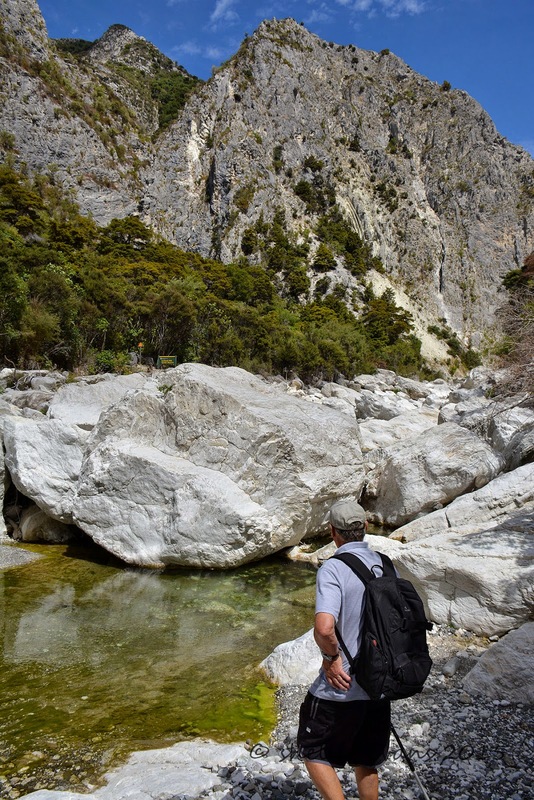 We also found our Teva enclosed sandals ideal for grip on the rocks and for the river crossings; the gravel only occasionally getting caught under our feet but easy to flush out with the river flow while still walking. And make sure you wear sunglasses on a bright day, the glare off the white rocks is brilliant. I would highly recommend this walk if you are a reasonably fit and active person (who doesn't have a gammy leg or knee) but personally I wouldn’t like to do it any earlier that mid to late summer; the water level would not only be higher it would also be very cold before then. 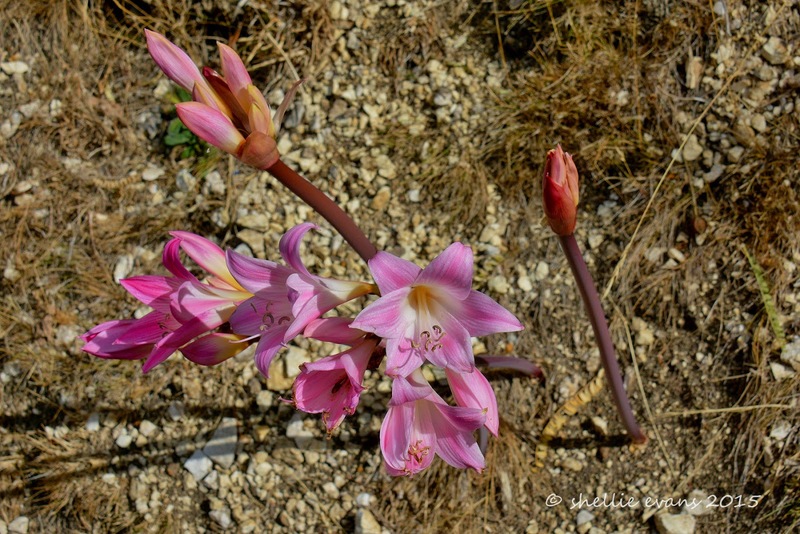 And you’d miss out on seeing the 'Naked Ladies'. 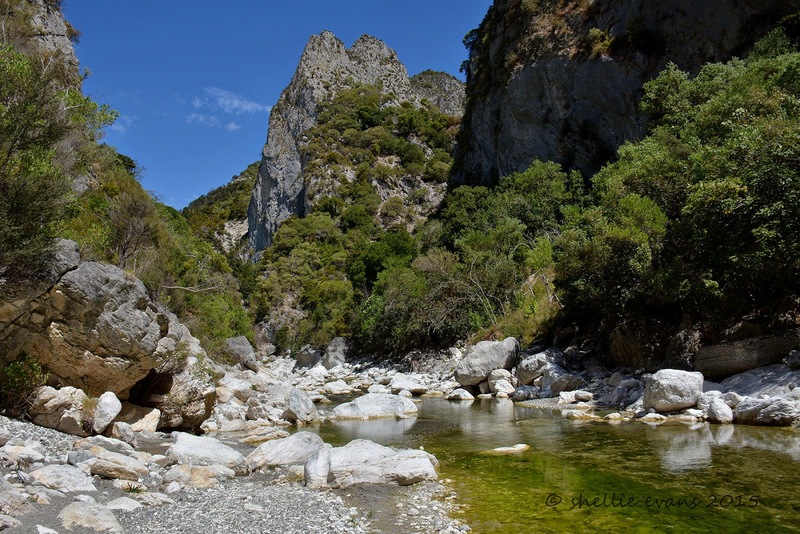 Some of you may remember when we were staying at Ward Beach in July last year, we took the road to Sawcut Gorge. 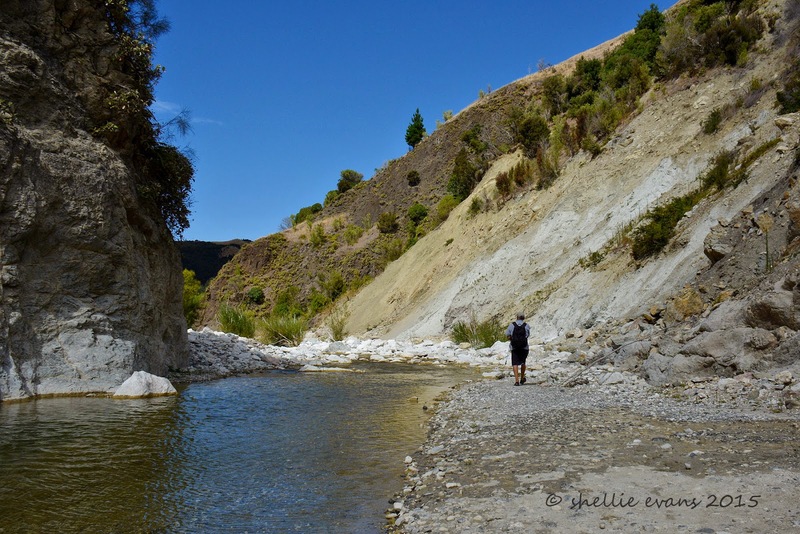 We didn’t intend to walk to the Gorge- there are many river crossings, it was the middle of winter and the water was ice cold and running high. We thought we'd check the road out and see where the walk left from. You’ll find that blog post here. February is an ideal time to do the walk and since we’re back at Ward we took the opportunity of crossing another ‘must do’ off our list. These next couple of blog posts are going to be mostly photos so apologies for any slow uploads for those that are reliant on mobile data or have slow broadband but as they say, a picture is worth a thousand words! 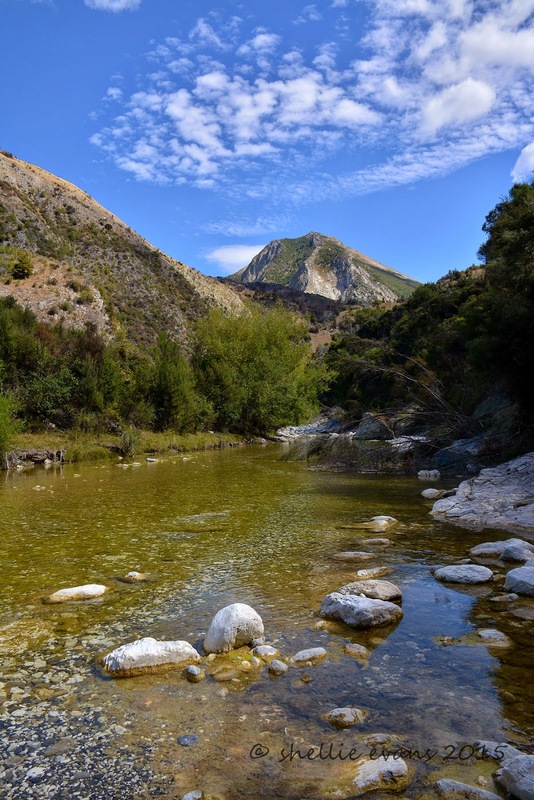 The Waima (Ure) River catchment is one of the direst areas of Marlborough with less than 600mm rainfall annually. The river dries up for months on end and even back in July (mid winter) there wasn’t that much water, now it’s totally dried up. 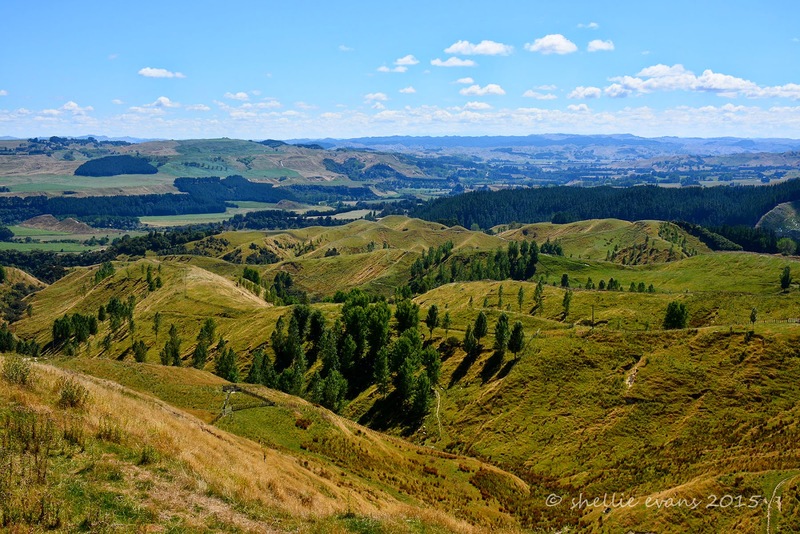 The road into Sawcut Gorge is narrow, gravel & 12kms long, it winds it’s way through farmland high up above the river bed. The snow on the mountains behind has long gone, the hills are tinder dry and devoid of stock. Towards the end of the road we can see where the ‘river’ runs out; a thin ribbon of water disappears into a boulder patch. I wonder if it travels underground for a distance and also what happens to any fish, perhaps they know that this river dries up and don’t populate it. I’m sure there would be eels and small fry during winter though. We arrive at Blue Mountain Station where the owners allow the public to use their property to park on while they walk to the gorge. It is rather strange pulling into the front yard of the house, it looks like a busy carpark with over a dozen cars lined up on the front lawn. When we came the last time, we were the only ones. There's a visitors book to sign and a donation box on the chair at the front door along with some information pamphlets. Luckily we have 4WD, there’s a steep track down to the river bed where 4WDs can park. The river level has dropped alot since our last visit but there’s still a good flow of clear water passing by and this time it’s not ice cold. The willows on the other side of the river are just starting to turn colour. 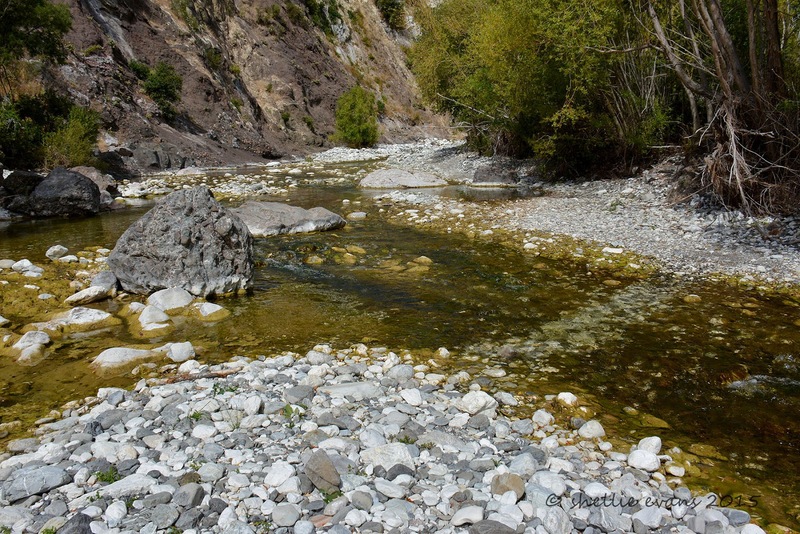 Other than the water level the other most obvious change is the algae that has stained the river bed green and made it quite slippery. The water has a high pH due to the limestone rocks, I think this, the warm water and the sun have provided an ideal environment for algae to grow. A small consolation is the fact that we can see where the track starts. 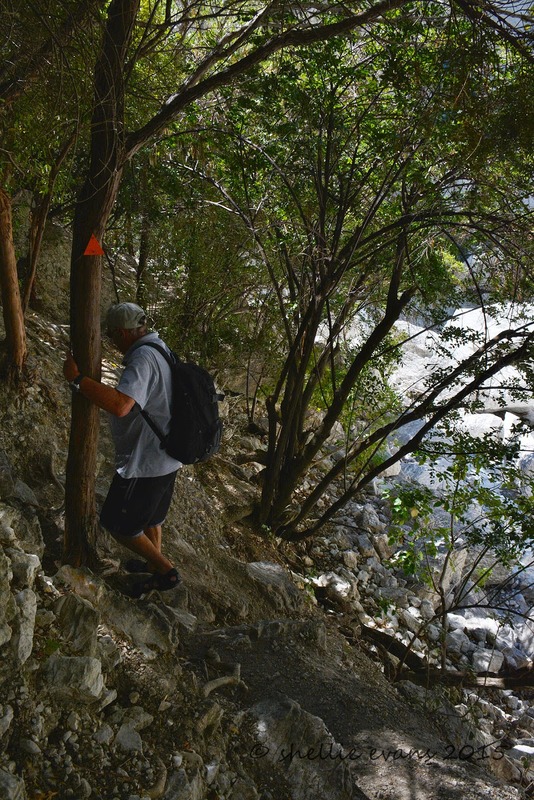 The route to the Sawcut Gorge involves following DOC’s sparsely placed orange triangles directing hikers up the Waima River bed. 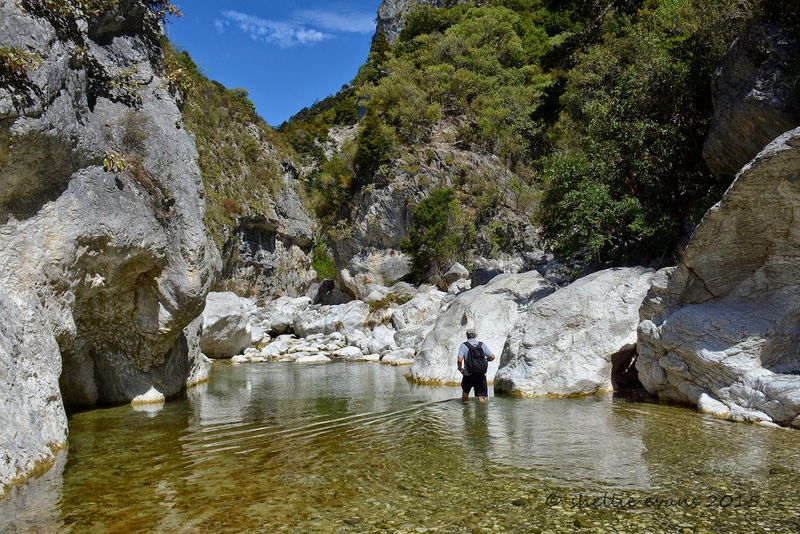 There are at least 30 river crossings, much rock hopping and some boulder climbing. 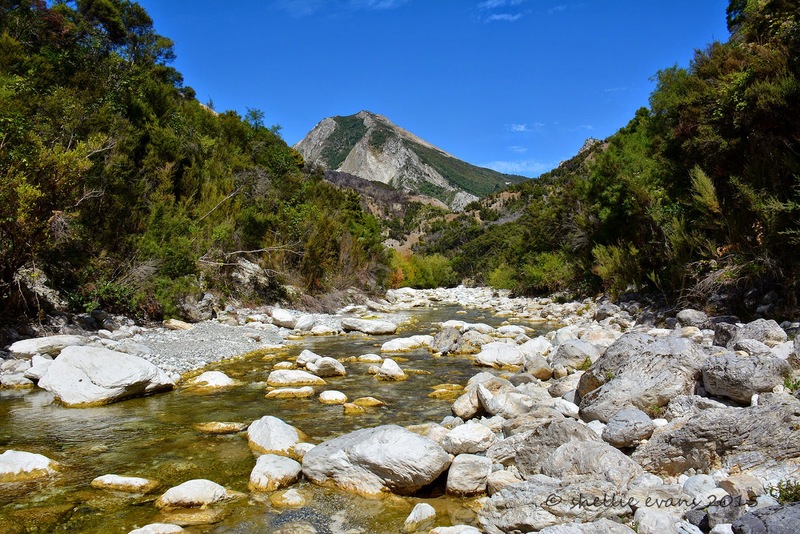 Occasionally the track will disappear into the bush on the side of the river for a short distance but mostly it is finding(fighting) your way over the rocky river bed. A walking pole is a definite requirement. 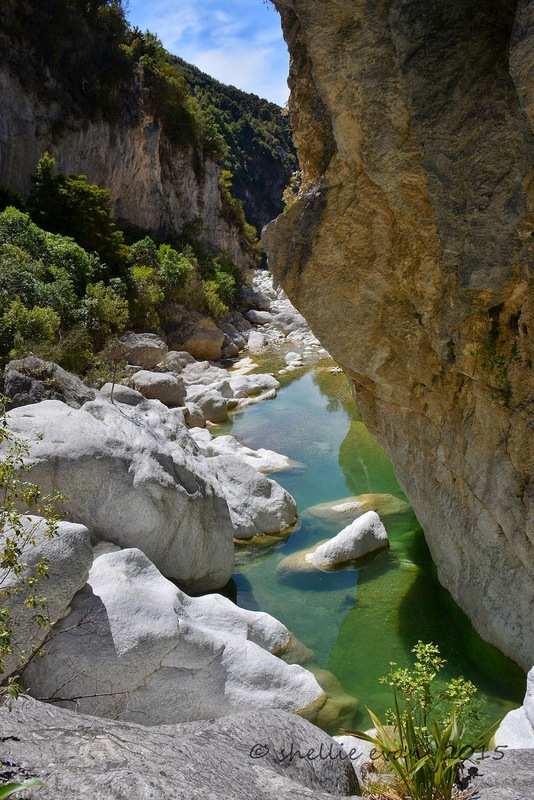 Much of the rock is stark white limestone, mixed in places with grey wedges of argillite, sandstone & mudstone. The boulders get bigger and Isolation Hill (1059m) looms ahead of us. Following the worn track through the green up river was not always correct, another track crossed the river to the left where an orange triangle pointed into the bush. 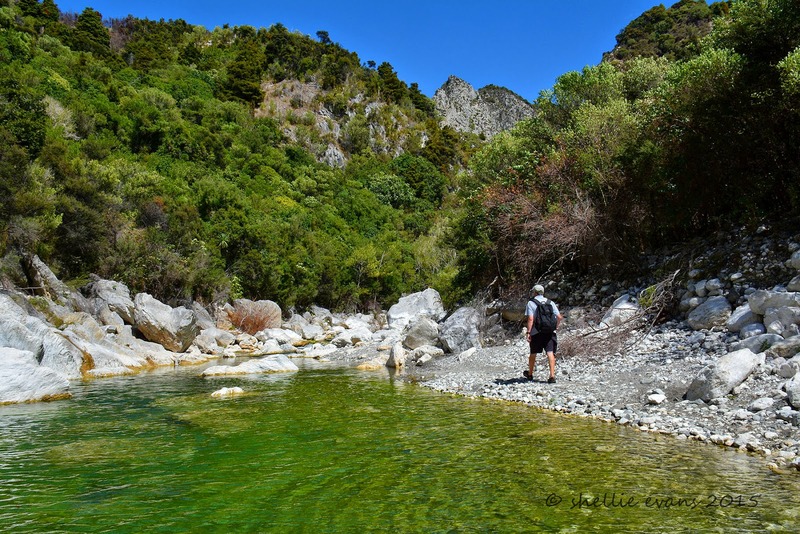 We debated which to follow & ended up taking the bush track. Which was just as well as there were some major boulders & a small waterfall to climb over and up at the end of the river track. It helped your legs & feet to find any patch of small pebbles to walk over. Because for every one of them there were six large rocky paths. I wonder if you can spot the orange triangle? That large rock ahead of David towards the back? Tiny orange dot? Yes, that's the next marker. Getting bigger! Also another triangle, at least we’re on the right track. But what you can’t see is…..
…the large pool in front of the triangle. It wasn’t until we were talking to the farmer (where we are staying) that he told us a very large ‘pet’ eel lives in this pool and usually comes out to great everyone walking through, of taking a dip, by wrapping itself around your legs. Thank God it slept in when we passed through! This is the pool from a little higher up, after climbing out of the pool at the far end, a track led up into the bush and across a steep scree slope (and we saw that a triangle pointed into the bush the other way- we missed the beginning of that track which would have saved us our pool walk). 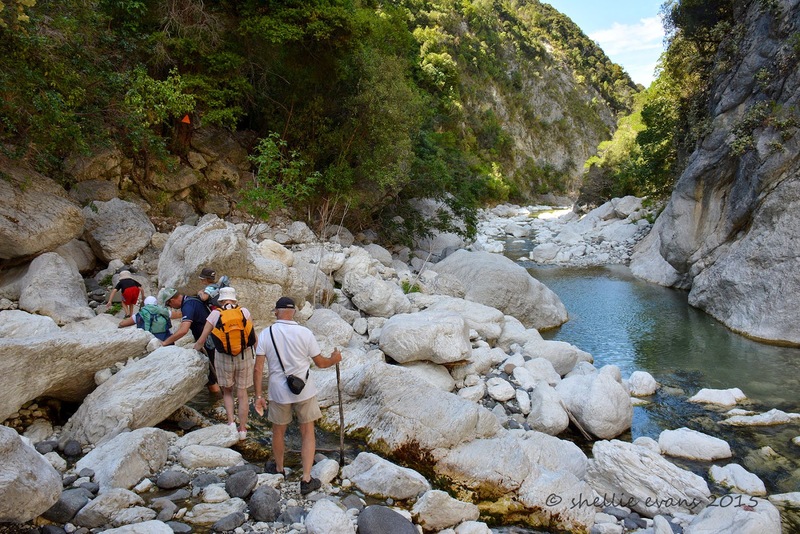 Back down into the river bed and the rocks have become boulders! These are larger than they look and we have to clamber over them to reach the far end. 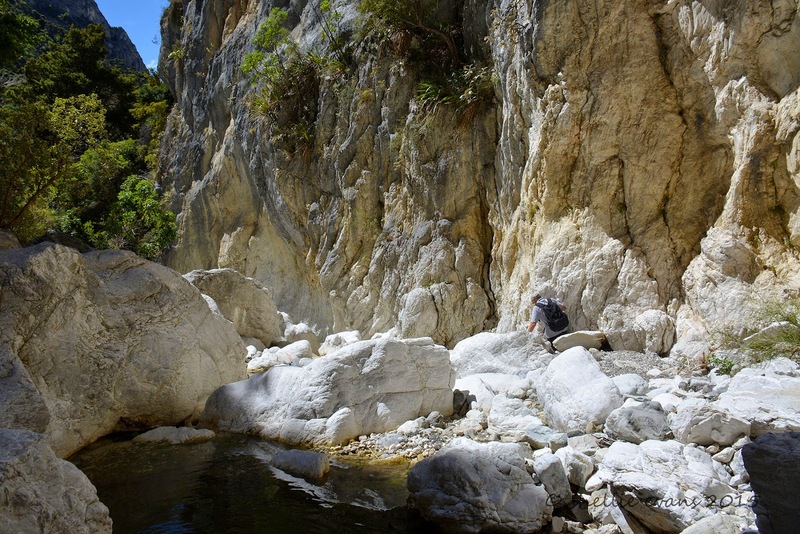 Imagine the river rushing down this canyon when there was a flood. I could see flood debris caught up high in the trees in some places. 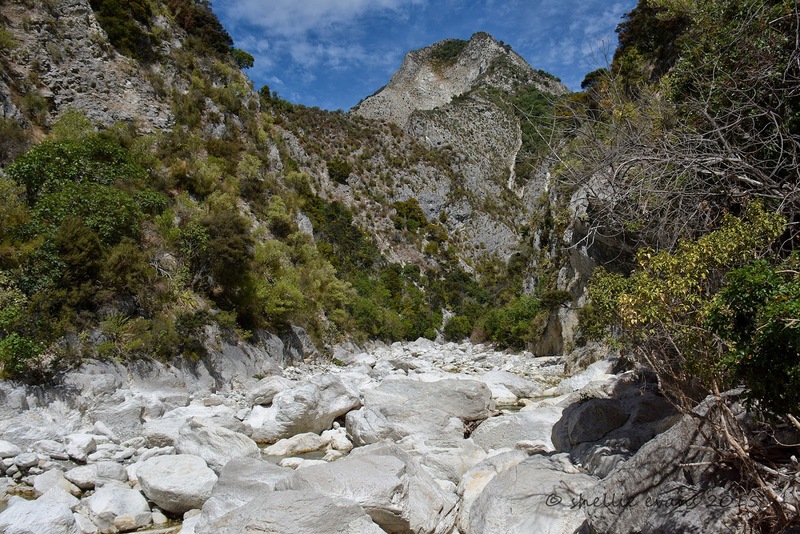 Sawcut Gorge is located in the reserve & we leave the Waima River here and enter the Isolation Creek canyon. It’s taken us about an hour and a half to get this far and we still have another 15 minutes or so of rock scrambling to do. 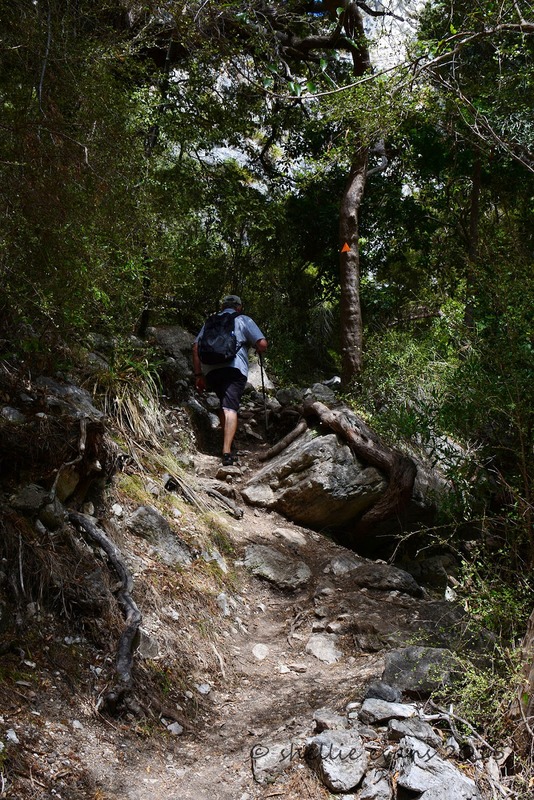 Another steep bush track up and over the point where the two waterways meet. I stand aside to let a family through, the little girl looking no older than 4 or 5- she's done well, they’re on their way back to the carpark. The guy warns us that there’s a bit of a party going on at the far end of the gorge- he said he looked around for the tour bus! That will explain the number of cars at the homestead. 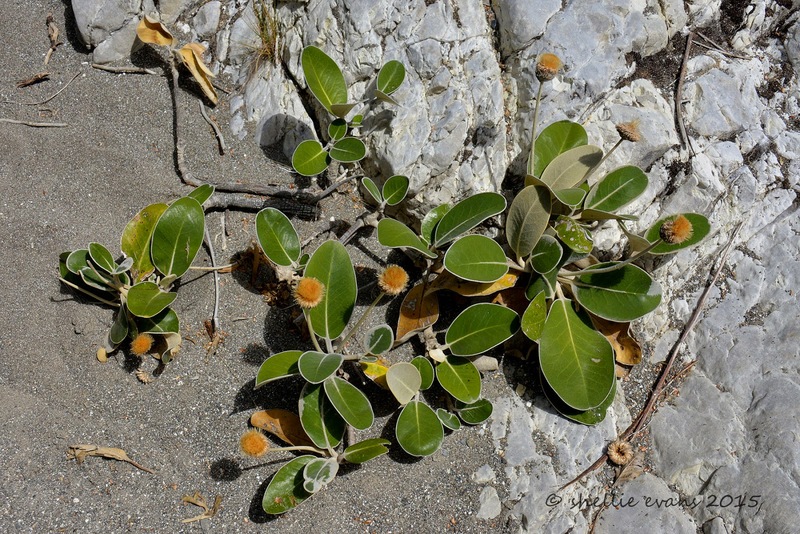 At the bottom of the bush track and up on the canyon wall is my first sighting of the Marlborough rock daisy, a tenacious shrubby plant with lovely daisy flowers, it's often found clinging to sheer rock walls throughout Marlborough. Unfortunately it has finished flowering. To be continued…Part 2…and I guess in the end, it was a lot of words & photos! Leaving Mangaweka we continued on heading south. 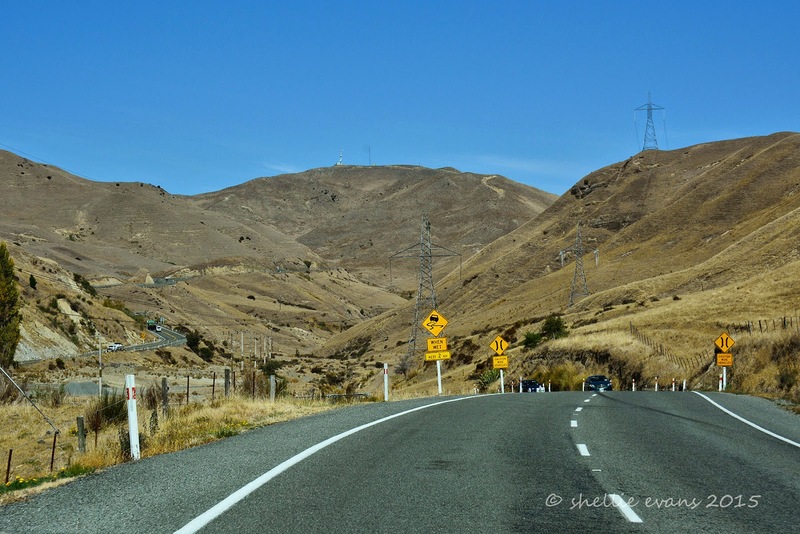 We took SH54, the scenic route, turning off the main road at Vinegar Hill. At the bottom of Vinegar Hill is reserve beside the river where freedom camping is allowed. Luckily it wasn’t one I chose to stay at on our way through; it was a beautiful spot, a large grassy area under trees on the edge of the river sheltered by those ever present white cliffs. But the entrance was a narrow and low tunnel through thick bush, there would be no way anything larger than a small campervan would get through. More’s the pity, as I’m sure it would be a very popular spot- maybe that is why they keep the trees low! The road's quite twisty with a lot of climbing as we wound our way up and over the many river plateaus that have formed over hundreds of thousands of years. The lookout at the top had 180 degree views looking west out over farmland. I should have done a panorama, this shot is looking north west, the direction we had come from. Foxton Beach was our next stop, we’d decided on a camp ground as we needed to do some laundry, give the batteries a boost after being off the grid for over two weeks and have a decent long hot shower- even though there were signs everywhere stating “5 Minute Showers Only Please!”. We figured as we were the only ones in camp there’d be nobody lining up to use them. 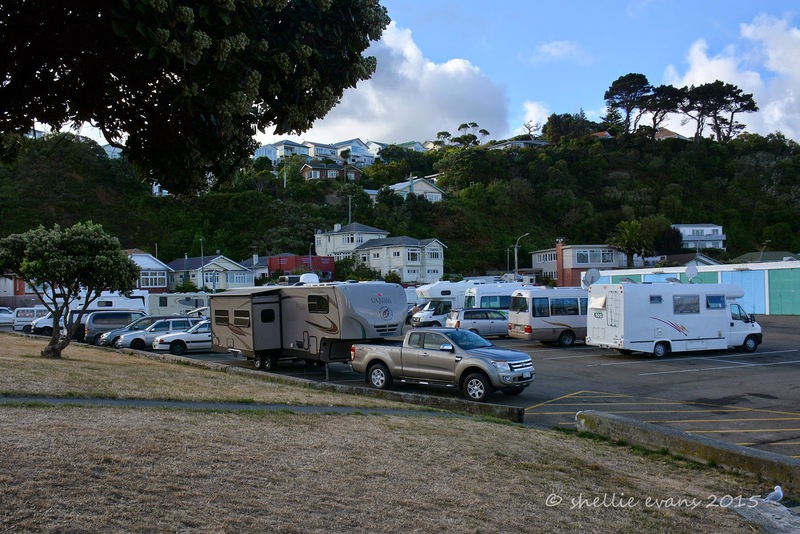 Foxton Beach Campground is obviously a very busy camp in the height of the season, it’s large and sprawling. 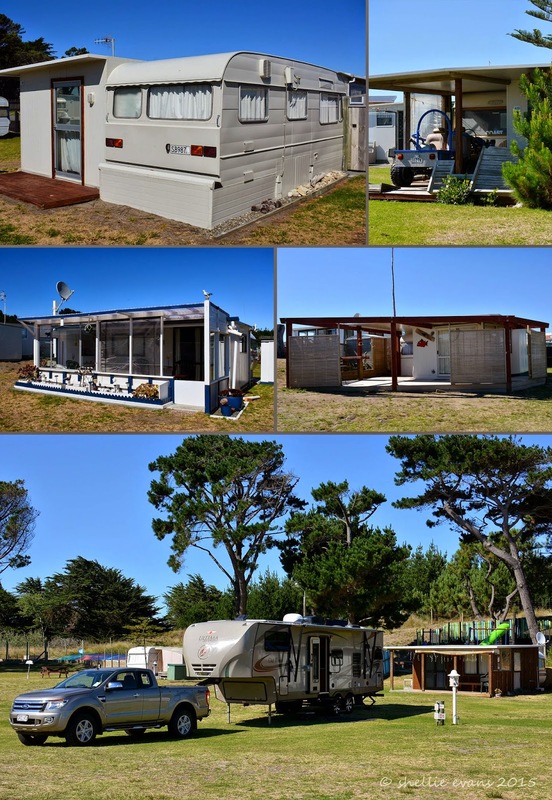 There are many semi permanent baches that looked to be owned (or leased) in the campground. Most have a caravan with a ‘lean to’ attached- I would say this must be part of the rules; able to be moved off the site and not leave a trace. Although looking at some of the more elaborate ones I guess that will never happen. Most have a quad bike garage attached too, the best mode of transport in beach communities. There are many batches for sale. The camp is beside a river and on the edge of the beach but there is no easy access to the beach as there are a lot of high dunes between the sea and the camp. There’s also no access gates through the fence or tracks at the back of the camp. Instead a sandy vehicle track follows the river to it’s mouth and at low tide you can drive right around out onto the beach. We did. There are plenty of signs regarding driving on the beach- it’s to be treated as a legal road, all drivers must be licensed, helmets must be worn if on a bike and the speed limit is 30kp/h. You also must stick to the hard sand, definitely no dune driving. It reminds us of Oreti Beach near Invercargill in the deep south, we had a lovely day there with the family back at the beginning of our travels. It looks like it must stretch as far too, disappearing over the horizon. 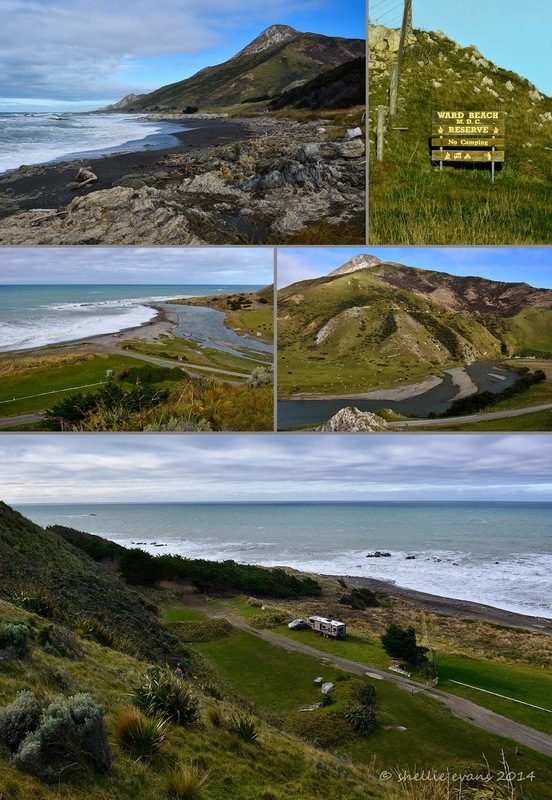 We drive up the beach until we reach the Foxton Beach Surf Club where there is another entrance/exit to the beach. We think about coming back in the morning and maybe doing a bit of fishing but I’ve been watching the weather and Friday is the best window of opportunity to have a calm Strait crossing; a fine day between rough seas and high winds. Foxton fishing will have to wait. We leave Foxton Thursday morning, heading for Evans Bay in central Wellington where we’ll stay the night before catching the 8am sailing with Bluebridge on Friday morning. 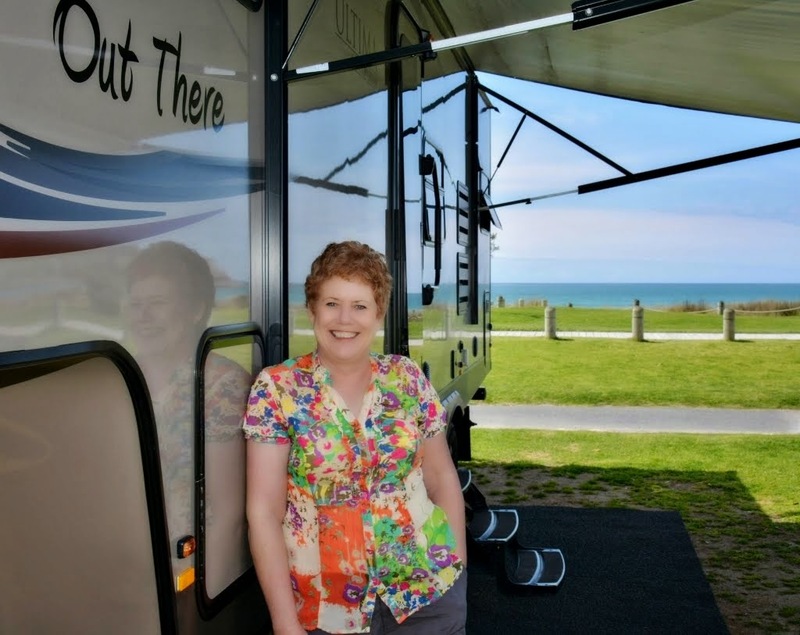 We pull into Queen Elizabeth Park near Paekakariki for lunch, driving through the park to the beach front but stopping on the way to view the US Marine Memorial. It’s a very interesting and informative memorial, there are six ‘hut’ walls with information panels on them, at the rear of the walls is another memorial, part of a LCVP (landing craft, vehicle & personnel) with the names of ten men that lost their lives in rough seas while on an exercise off the beach nearby. Over 15,000 US Marines camped in the area during WWII, this was the training base for infantry regiments preparing to fight the Japanese in the Pacific and help defend NZ if it had been attacked. NZ solders were away fighting in North Africa & Europe and couldn’t be spared. British Prime Minister, Winston Churchill asked the US President Roosevelt to send a division of US Marine troops to NZ. The first US Marines arrived in mid 1942 and the last left in late 1943. Troops returned to Paekakariki for R&R after battles in the Pacific and were not always welcomed by the locals & the missing NZ troops who called the Marines 'bedroom commandos'. Over 500 marines married Kiwi women. We made it safely through the Wellington City traffic and pulled into Evans Bay mid afternoon. 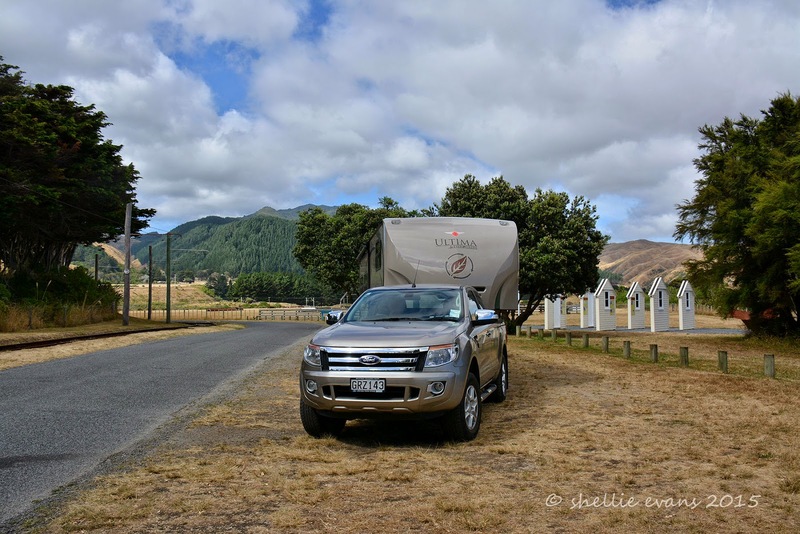 What a transformation this free camping area has gone through since our last stop there, on our way to the North Island last November. Then it had only just been given the green light as an parking spot and we were the only ones in overnight. Fast forward 3 months and it was like Piccadilly Station, at last count around 10pm there were 27 vans & sleeper cars parked up- it’s meant to be for CSS vehicles (certified self-contained) but at least half of the overnighters were in cars that would not have been self-contained. I can see that this will be another site we’ll lose because people don’t follow the rules. We had to ask a couple of vans to move as they parked outside the marked parks & too close to the corner which we had to pull around at 6am in the morning. One of them, a large motorhome, pulled in at around 11:30pm and parked mostly in the drive right in front of us. I don’t think David got an hours sleep all night, every vehicle he heard he was sure it was going to park right in front of us- I told him not to worry, I'd be happy to knock on their window at 5:30am. And before anybody asks, yes we’re taking up more space than most- it was all mostly clear when we arrived. We pulled into a double park but were overhanging too much. It is actually a large carpark but most wanted to park down our end away from the corner traffic noise I think. We were up and gone just after 6am and were lined up to board the ferry by 6:30am, missing all the morning traffic through the city. David had no problems driving on, we were squashed into place between two large trucks near the front. We found ourselves a comfy seat upstairs and settled in for a boring 3 hours. I always forget to bring something to read and the movie wasn’t that great. I did go outside a number of times but between the diesel and cow poop smell (a stock truck was directly below the back deck) it wasn’t a pleasant experience. Mind you the strong coffee smell inside wasn’t much better. 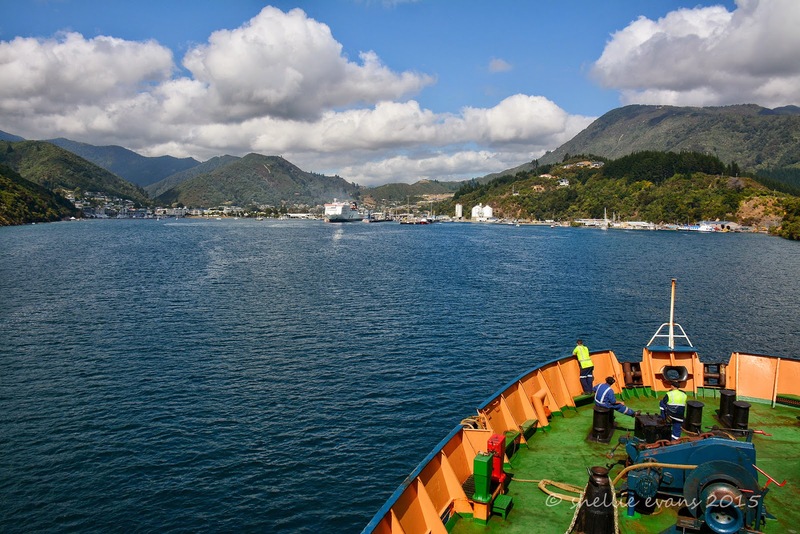 As I had hoped & planned for, it was a smooth crossing and not before time we were pulling into Picton once again. We were hoping to call in and see friends in Picton before heading off but they were out of town for a few days. 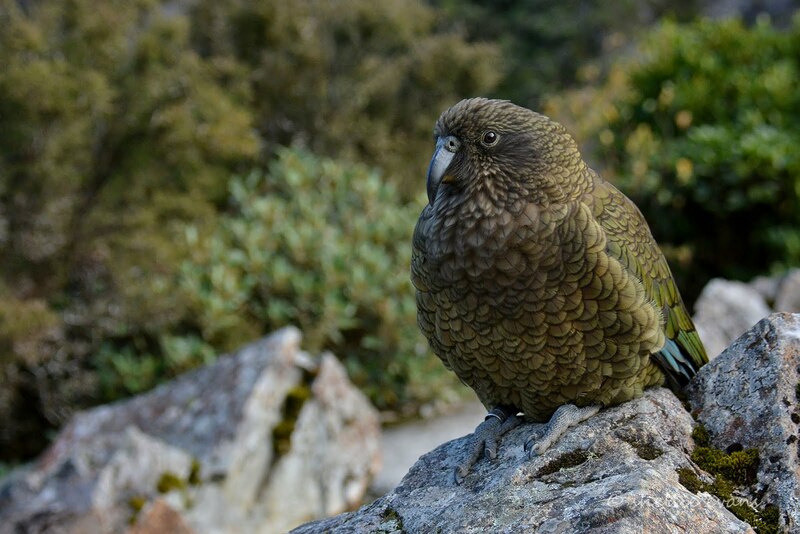 Initially we had planned on leaving the van at Nelson Lakes & then driving the Rainbow Road & Molesworth Station over two days, staying in Hanmer overnight, before picking the van up again and heading west. 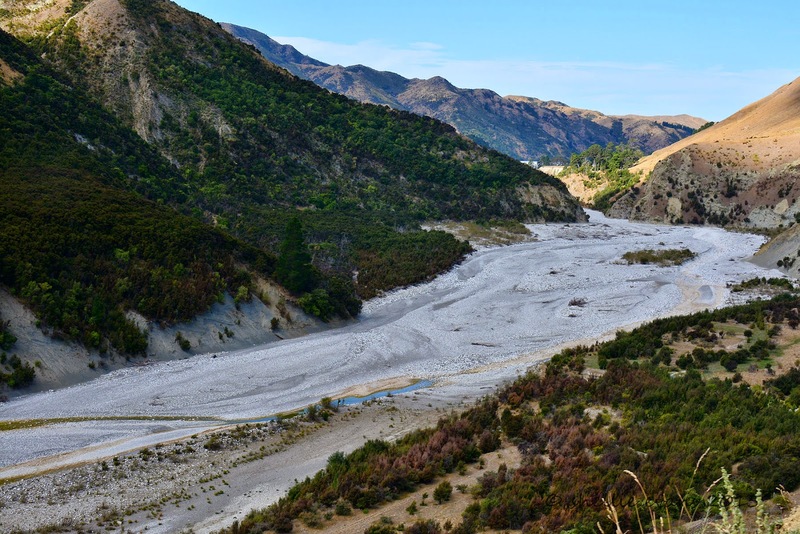 These plans were thrown into disarray when the Molesworth Station road was closed a few weeks ago due to the high fire risk because of the extreme drought situation over much of the South Island. 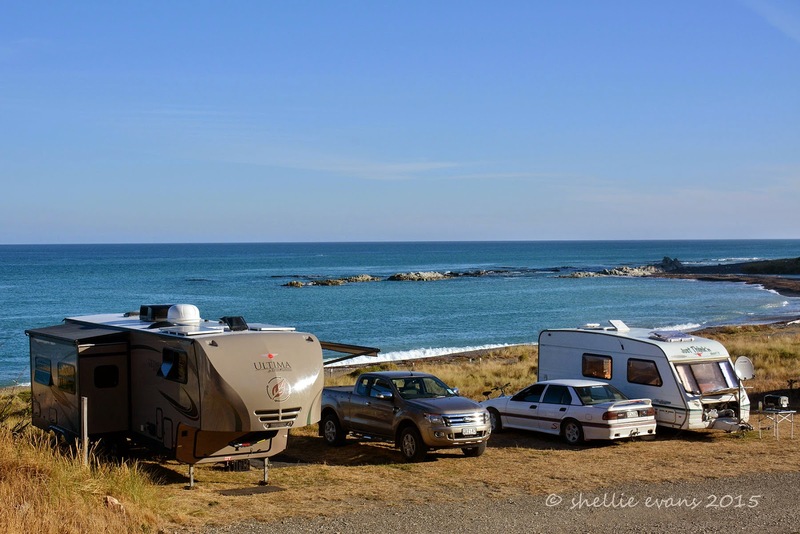 We decided to head east to Ward Beach for a few days, then catch our friends next week before heading west to Murchison. Some of you will remember Ward Beach from when we stayed there last July, in the middle of winter! The transformation of the surrounding hills, since we last passed through this area, is amazing. It’s bone dry everywhere you look except, of course, for the bright green of the many vineyards. There’s not much stock in the paddocks although I do see a few lonely (and hungry, no doubt) sheep & cattle here and there. Near Dashwood Pass we can see where a grass fire has burnt out a large area. 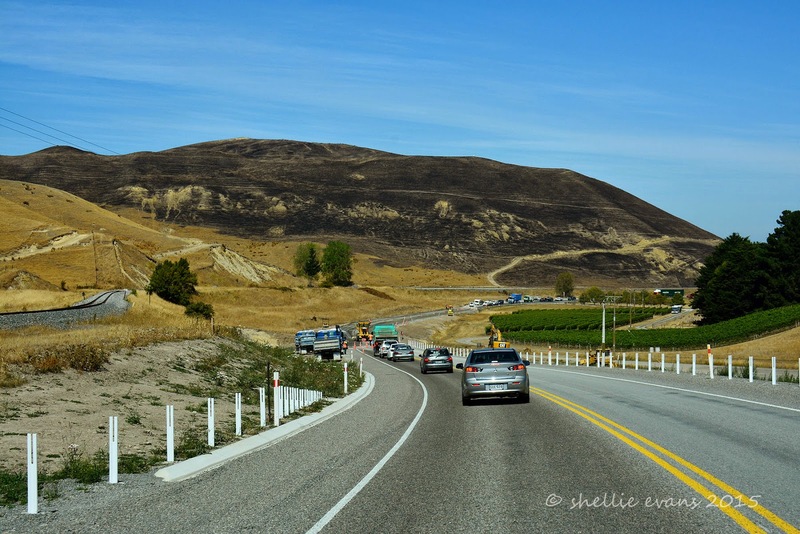 I recall when this happened back in January and the main highway was closed for a few hours as they fought the fire. Toady we’re stopped for a short time at road works. 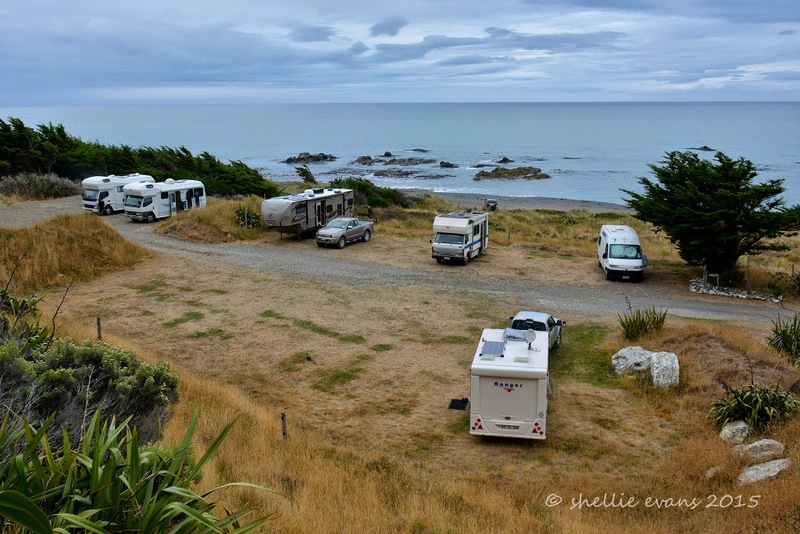 Finally we pull into the camp site at Ward Beach, once again we’re surprised, it’s looking much more inviting than it was when we were here in winter- last time the sun (when it made an appearance) disappeared behind the hill before 3pm, now it's about 5:30pm. It’s also amazing how a fine day can change your outlook. This time we’re not the only van in camp, there are 6 or 7 parked up and they come and go all weekend. The land belongs to a local farmer and is right beside the beach reserve. All he asks for is a donation and you can stay for as long as you like. It’s strictly for CSS vehicles only and there is no fresh water available. 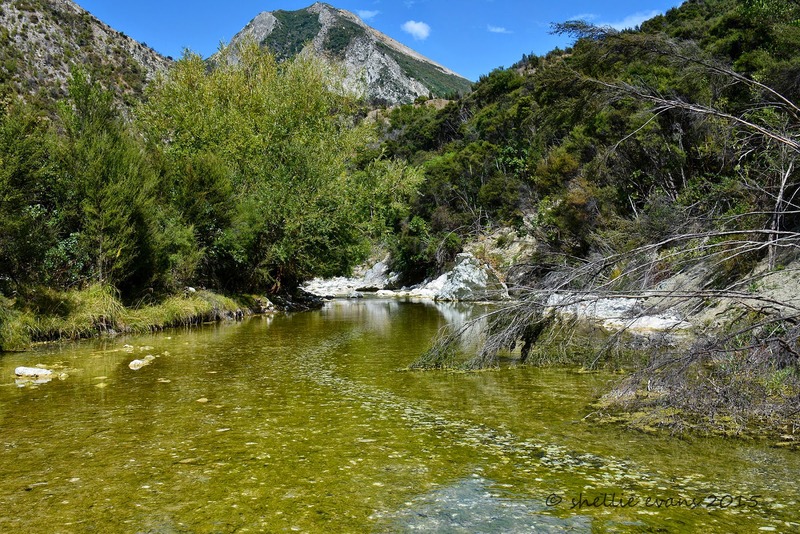 It’s a beautiful spot and if you’re a keen diver, paua & crayfish can be found just off shore. This morning a pod of dolphins frolicked around the rocks offshore, we think they may have been the tiny and rare Hectors dolphins. Here's the camp today and below it, the camp last July. The river on the right has now dried up and there's just a large stagnant pool near the rocky bank. I wonder how many might know what we do next….